The full proof soft cookie with red, white, and blue candies for a festive look. 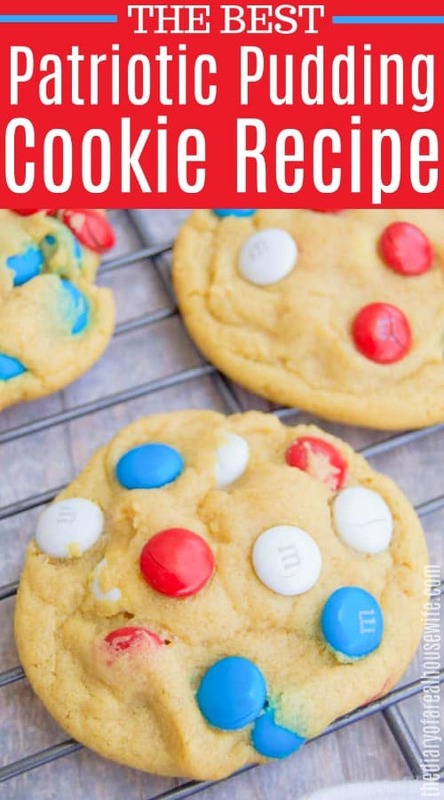 Not only are these Patriotic Pudding Cookies perfect for the 4th but they taste amazing! Can you believe summer is here? Alright technically it’s not summer yet but school is out and we are spending most of our days at the pool so it feels like summer to me! Which means it’s time to start thinking 4th of July! It will be here before you know it and you know I love to go all out with themes. I just post a few days ago over 50 red, white, and blue recipes and I may have a hard time narrowing it down. All out food on the 4th will either be grilled or themed! I love that these Patriotic Pudding Cookies are themed for the 4th but also love that they are so good and pretty much foolproof to make. The pudding mix makes the cookies so soft! Start by creaming your butter and sugar together in a stand mixer or in a large bowl with a hand mixer. Next mix in the egg and vanilla and mix until smooth. Now add your dry pudding mix, salt, baking soda, and flour until well combined. I added 3/4 cups of M&M and mix into dough well and use the rest to stop once rolled out. Allow cooling in the fridge for 1-2 hours. Preheat oven to 350 degrees F and prepare a baking dish with nonstick spray or parchment paper. Roll chilled dough into balls and place on prepared baking sheet. 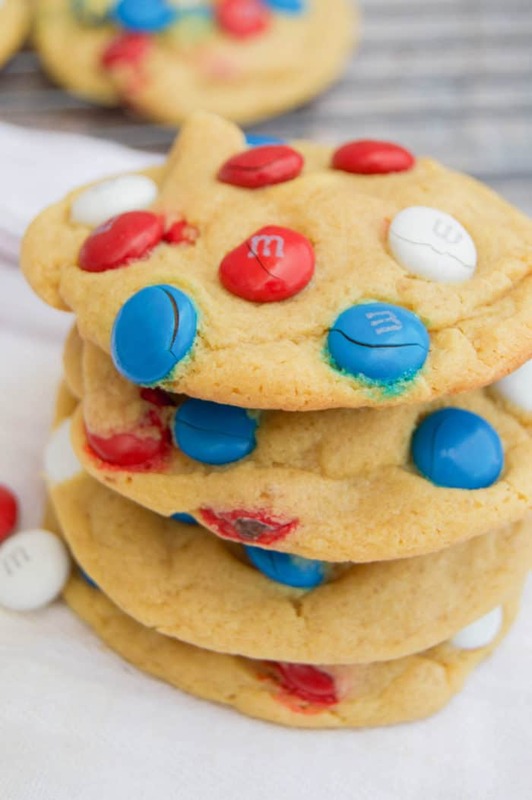 Place remaining M&MS on top of each cookie. This way when they bake you can see the colors and they are not all hidden away. Bake for 9-11 minutes and allow to cool for 5 minutes on the baking sheet before allowing to fully cool on a rack. Do I need to prepare the pudding? No, for this recipe do not prepare the pudding according to the box directions. You want to only use the dry powder. Can I skip the chilling? For these cookies, you must chill. At least 1 hour to get these cookies to bake correct and taste amazing. Trust me the hour is so worth it. I gathered some of my favorite recipes from around the web that you will love. Over 50 awesome red, white, and blue recipes for you to try. Chocolate Chip Peanut Butter Cup Cookies: These Chocolate Chip Peanut Butter Cup Cookies are loaded with your favorite candy. Chocolate and peanut butter heaven! Walnut Chocolate Chip Cookies: These soft and chewy Walnut Chocolate Chip Cookies are the perfect combinations of sweet and salty. The soft crunch of the walnuts are the perfect pair with the best chocolate chip cookie. Coconut Chocolate Chip Cookies: Coconut and chocolate make the perfect combo! These Coconut Chocolate Chip Cookies are perfectly baked and loaded with chocolate chips and shredded coconut. Cream butter and sugar together in a stand mixer or in a large bowl with a hand mixer. Mix in egg and vanilla and mix until smooth. Add dry pudding mix, salt, baking soda, and flour until well combined. Add 3/4 cups of M&M and mix into dough well. Allow cooling in the fridge for 1-2 hours. Preheat oven to 350 degrees F and prepare a baking dish with nonstick spray or parchment paper. Roll chilled dough into balls and place on prepared baking sheet. 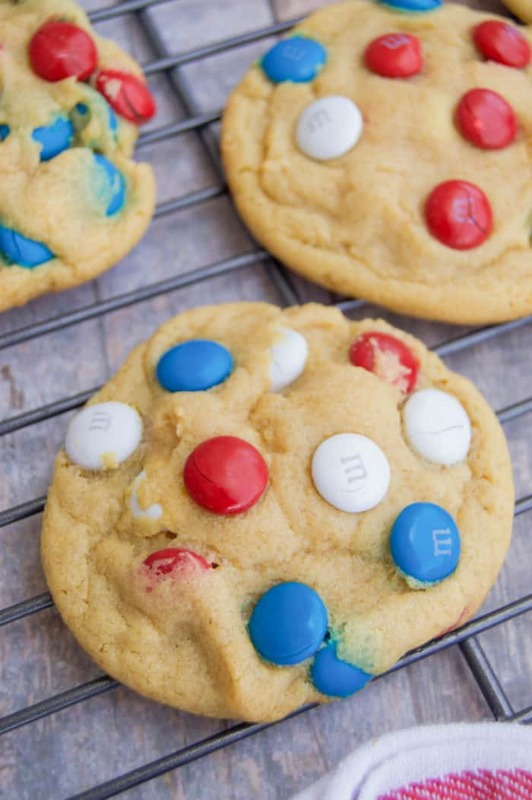 Place remaining M&MS on top of each cookie. Bake for 9-11 minutes and allow to cool for 5 minutes on the baking sheet before allowing to fully cool on a rack.